The UK Waterways Guide provides a comprehensive directory of maps and services available on our UK canals and rivers. Narrowboat holidays on our UK waterways are very popular and there are many companies that hire boats for day trips, short and long holidays. 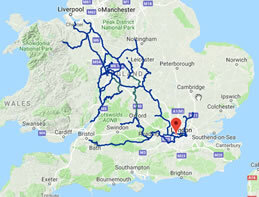 Our services guide pages list boat hire companies for each canal and display a map showing the location of each company. So if you want a holiday on the Grand Union canal or wish to hire a canal boat for a weekend on the Llangollen canal, you will find many companies with boats to hire from many different locations. There are many places to buy a narrowboat. These range from specialist canal boat builders, boat yards, marinas to specialist brokers. The Inland Waterways Association has an excellent article that covers all aspects of Buying A Boat. The information we supply in our guide is segmented by the location of the various companies selling canal boats. Our services page displays service suppliers by canal and list the results with a Google map showing the location of each company. Visit our services pages to find out the details of all of the companies with boats for sale. Pubs are a popular stopping points and most public houses tend to serve food as well. We list pubs that are either on the canal or within reasonable walking distance. The ideal pub is one which has moorings and other services such as water, waste disposal and, of course, WiFi. The information window for each company displays all the services that we believe are available. In the near future, subscribers will be able to feedback information about services that are (or are not) available and will also be able to see satisfaction ratings. Many people want an occasional break from cooking and will be looking for good places to eat out. There are many restaurants on or near to the canals. Most pubs now offer either bar food or have a restaurant. Our restaurant lists for each waterway includes dedicated restaurants as well as public houses that serve bar food. Some restaurants maybe close to moorings and other services such as water, waste disposal and, of course, for some it may be important to have access to WiFi. The information window for each company displays all the services that we believe are available. In the near future, subscribers will be able to feedback information about services that are (or are not) available and will also be able to see satisfaction ratings. The UK Map shows the waterways of England and Wales. Each canal can be viewed individually with additional information relating to the services available such as diesel, water, pubs, restaurants etc., as well as the locks and winding holes. There are many sources of historical information for canals such as the Grand Union, the Kennet and Avon and Oxford canal. This is a large version of the map available on mobile devices. The map displays a limited number of services, the services that have been deemed most useful whilst on the move. Mobile devices are small with a limited screen to display information, so in an effort to make the most of a small space, the functions available have been reduced to a minimum (18 services plus locks and winding holes). Selecting a services on the left will cause the service to be displayed on the map. Each of these services has a unique icon asssociated with it. Click on an icon for more details. The Mobile Map tabs opens the demo mobile map application in a seperate tab or window. This map is provided to allow you to familiarise yourself with the functionality before you use it on your mobile device. On mobile devices, screen space is a premium. The map uses sliders to show and hide the features that allow you to select a canal and also to select which services to display on the map. Please read the Sliders section in the Help section, to gain a clear understanding of how they work. This page provides a simple way of selecting different services and displaying them either for the whole country or for a specific canal and branch. If a canal has already been selected then the service list only contains services available on the selected canal. The initial coverage is limited to 54 canals and rivers. Another 47 have been plotted along with their locks and winding holes. The quantity of data that has to be entered for each canal is considerable. Consequently the initial versions will cover London and the Midlands and the remaing canals will come online as they are completed.